OCT is often used to evaluate disorders of the optic nerve as well. The OCT exam helps your ophthalmologist see changes to the fibers of the optic nerve. For example, it can detect changes caused by glaucoma. OCT relies on light waves. It cannot be used with conditions that interfere with light passing through the eye. 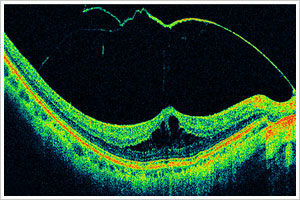 These conditions include dense cataracts or significant bleeding in the vitreous.